The early years of this century saw the most broad-based spell of wealth creation in recent history. The period was remarkable for the breadth of its geographic coverage, with emerging market economies – especially China and India – not just sharing in the growth, but driving much of the action. More importantly, it was socially inclusive: all levels of society shared in the rewards. This golden age came to a halt with the global financial crisis. Wealth growth resumed soon afterward, but at a lower and more erratic pace. Widespread depreciation against the US dollar was partly responsible for this. 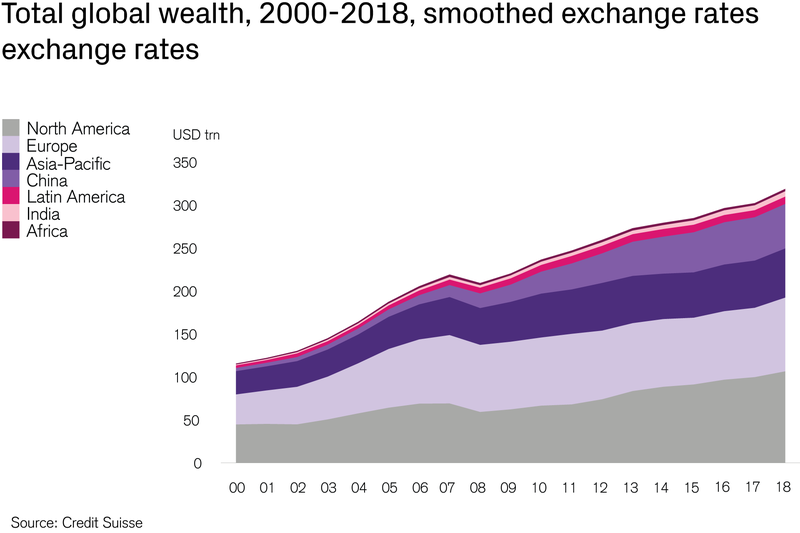 By replacing the real exchange rates with smoothed exchange rates, it is clear that global wealth has actually risen every year this century except for 2008. When current exchange rates are replaced by smoothed exchange rates (thereby eliminating short-run currency fluctuations), global wealth has risen every year this century apart from 2008. However, the pattern of wealth creation changed significantly after the financial crisis. The source of wealth growth shifted strongly toward the United States. Furthermore, financial assets initially recovered faster than non-financial assets, assisted by the low interest rates that have spurred asset price inflation. 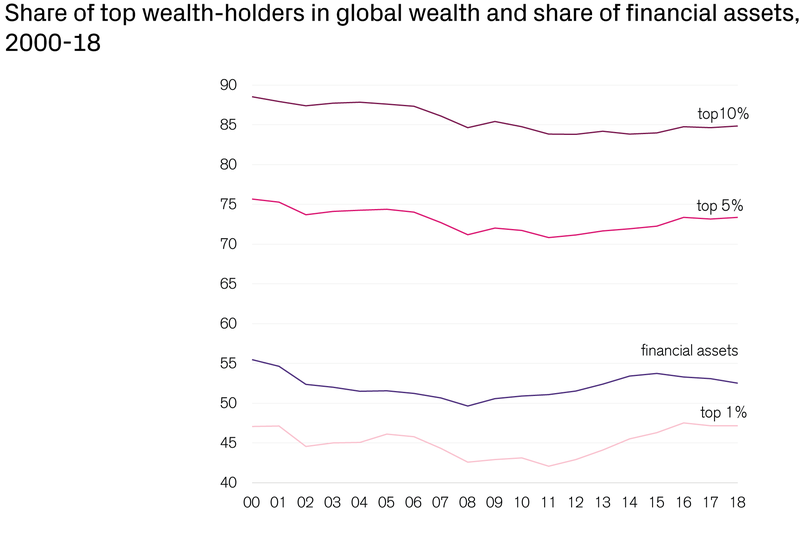 Top wealth holders benefited most from the rise in financial wealth after 2008, leading to rising wealth inequality in all parts of the world. In every region bar China, median wealth stopped rising, and in many places declined. Wealthier individuals hold a disproportionate share of their assets in financial form, especially company securities, so that the share of the top 1%, in particular, is expected to be sensitive to equity prices and, more generally, to the relative importance of financial assets. The infographic below confirms the above mentioned link. The share of the top 1% declined prior to the financial crisis and then reversed after 2008, resembling the financial assets share. The share of financial assets peaked in 2015 and then trended downward over the past three years – so has the wealth share of the top 1% of adults. The ranking by median wealth per adult favors countries or regions with lower levels of wealth inequality. Median wealth values reflect the circumstances of the average adult and, within countries or regions, as a trend give a good indication of how the average person has fared over time. Although the countries with the highest median wealth are located in Europe and the Asia-Pacific region, North America leads the regional ranking by a huge margin. Median wealth in North America is currently more than three times the level in Europe and China, and 50 times the level in India. Remarkably, median wealth in China exceeded the median value in Europe briefly in 2016 and remains close to the European level (USD 18,150) today. This is partly a reminder that Europe is quite heterogeneous and includes a number of countries with relatively low wealth. Prior to the financial crisis, the regional trends were similar and all moving strongly upward. The upward trend then halted or reversed in all regions except China. The decline in median wealth was less pronounced than the upswing, and the median recovered in some regions. Wealth inequality has not yet fallen significantly, but has stabilized according to most indicators. Thus the future prospects for inclusive wealth growth look more promising than they have for the past couple of years.